So it’s pretty frustrating to run a separate power cable to outdoor/distant networking devices like outdoor access points, IP cameras, VoIP phones. That’s when PoE is useful, and now we’re going to discus about how can we make our own diy poe injector and it’s advantages over commercially available solutions. Why make your won DIY PoE injector instead buying one ? The first thing comes to mind is about money, there are cheap PoE injectors available, but many of them are ridiculously priced. Why not use some spare electrical components lying around to do the job ? Another advantage is you can directly hookup this to a battery, that will dramatically reduce the power wastage. You could customise the PoE injector according to your need. And learning about about how Ethernet PoE works is extra benefit, your next mess-up with PoE will be much easier 🙂 . 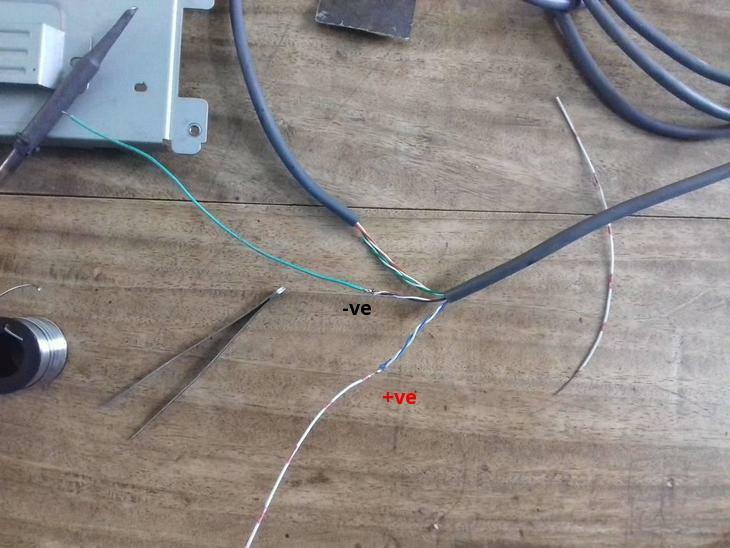 In general we use Ethernet over twisted pair, the cable is commonly know as LAN cable, but Ethernet’s physical layer is not just limited to twisted pairs, initially it used coaxial cables ! Now optical fibres are being extensively used. In 10/100M Ethernet over twisted pair, only 2 pairs(4 wires) are used, so we can easily use other two unused pairs of a Cat5/Cat6 cable to send the power to distant device. As all 4 pairs are used in Gigabit Ethernet, you simply can’t cut the unused pairs to send the power. This step exclusively depends upon your router and available components. If the router/AP/CPE can take power directly from the ethernet port then you’ve to configure only the Power sourcing equipment (PSE). If the router/AP/CPE can’t take power from the ethernet port, then you’ve to make a power splitter at the distant powered device (PD). For me, the outdoor access point can take power directly from the ethernet port, so I don’t have to make the power splitter. For the power sourcing equipment(PSE) you can use do it as you want. 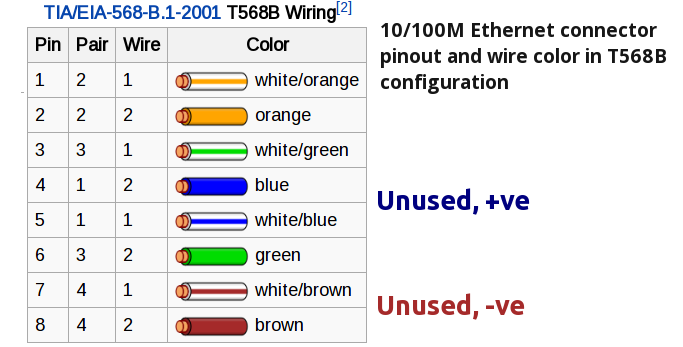 I simply spliced about 4″ outer jacket of the UTP Cat5e cable, separated the blue+white/blue and brown+white/brown wires, stripped them and soldered with some wires. You can even connect the wires without soldering, but that may be not as sturdy as soldered ones. Now It’s just matter of connecting them to a power source, you can use a suitable AC-DC adapter, preferably the one provided with your device. Or you can connect this to a battery which is suitable with the router’s power requirement. 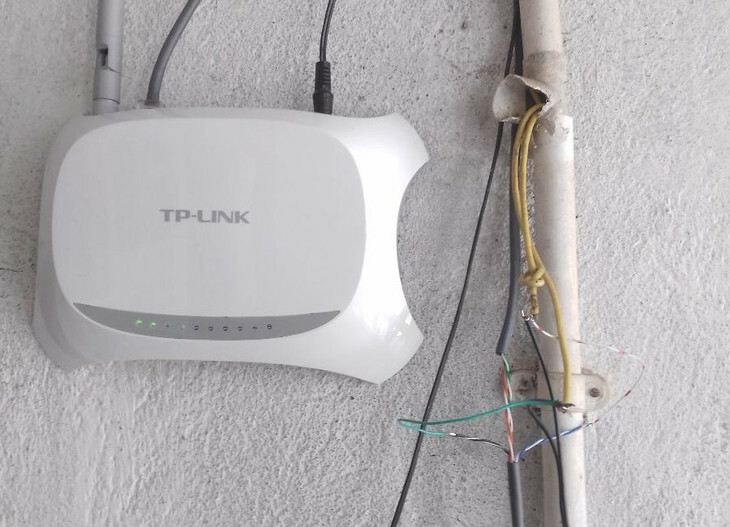 Few router, outdoor AP accepts a wide range of input 12V to 24V, so you can connect it safely to a 12V lead-acid battery without any fear. If your router runs on 5V, then you can safely connect it to a 6V lead-acid battery with two 1N4007 diodes in series, like this ADSL modem, router UPS project . Below how I connected both my router and outdoor CPE directly to a 12V 60Ah solar battery, it provides almost 3 days backup without sun. The Cat5e cable is 25 meter, connected to a Airpro outdoor AP, which consumes around 500mA at 12V. The TP-Link router happily works on a wide voltage range, directly connected to 12V DC from the battery. The Cat5 cable always wastes some power, higher voltage means lower current, hence lower power loss. Try to power the device with a higher voltage like 24V or 48V if possible. Most outdoor access points won’t work if voltage drops below 10V at the receiving end, will result in frequent reset. So calculate voltage drop in the cable. Here how could you calculate the voltage drop, according to Cat5e cables specification, DC loop resistance per pair is around ≤0.188Ω/m, with the worst cable, let’s say it’s 0.2Ω/m. As we’re using a pair of wire in parallel, so the effective DC loop resistance is 0.1Ω/m, so for 25m of cable, total DC loop resistance is 25x(0.05×2)=2.5Ω . At 500mA, the voltage drop will be 0.5×2.5=1.25V . This voltage drop is calculated with the worst metrics, so we may expect a 1V drop at the receiving end. So you’ve to choose a power supply that’s capable of supplying adequate voltage including the drop. Now another thing about cheap Cat5e or Cat6 cables, most of them are made from copper clad aluminium, they poses much higher resistance, so much more voltage drop and power loss. These wires breaks if twisted hard, easiest way to identify them. So for a DIY PoE injector project go with good cables. So that’s all for the PoE injector DIY project, it may be missing some useful info, let me know how can I improve it further through the comments. Further reading at wikipedia. PoE for Gigabit Ethernet is going to be a little difficult, as it’s involved with pushing the power through the Ethernet magnetics, and at higher current the Ethernet magnetics will surely heat up or even blow-up due to their ultra thin winding and higher resistance, it will be interesting. For your curious mind inside a Gigabit ethernet magnetics, this one is on my laptop. I’ll write about a DIY Gigabit PoE in future after purchasing a PoE capable Gigabit CPE/router. This is very unique and interesting information. Thanks for sharing this with us. Kindly post more informative content like this.